DECK-DOC is the only product that will repel moisture being absorbed into the timber for several years. The oil absorbs into the timber and seals from the inside as well as the outside. This feature is important as it protects the timber against wood rot and fungal damage such as mildew and algae. Equally important the oil will encapsulate the timber and retain the natural oils and tannins therein, preventing the timber drying out, cracking, splitting and warping. The tannins determine the colour of the timber, so protecting the tannins and keeping them in will retain the timbers natural colour. DECK-DOC’s Revolutionay Oiling System will protect for years will never crack or peel. The desire to have the cosmetic appearance of the timber looking at its best all the time. As with all things exposed to the weather they become dirty with accumulated dust, grime and air borne pollution. We wash and polish our motorcars to keep them looking good, so to we need to care for our outdoor timber. After time timber can appear grey because of dirt build up. It is not the timber that has turned grey, it is the accumulation of dirt built up on the surface. The dirt build up needs to be cleaned off from time to time. Refresh with a light coat of oil and the cosmetic appearance will came back to like new as the oil is protecting the colour in the timber fibres. If timber is not exposed to the full weather elements and has some protection, the cosmetic surface and the natural beauty can be easily maintained by occasionally cleaning the surface by lightly sweeping with an oiled Lambs Wool Applicator and Oil Scouring Applicator. ABSORBING COATINGS: Natural oil absorbing coatings brings out the timbers natural colour and beauty, and only needs enhancing and enriching with repeat applications and does not require costly maintenance. Moves with the timber, encapsulates the timbers natural oils and tannins, protects the colour and protects the timber exactly. How often do I need to apply the oil? See with the eye when you think the Surface appears dry and in need of more oil. Some parts may need more oil sooner than others as some areas are exposed to the weather more than areas that are under cover. For frequent maintenance, there is no need to clean the timber surface again, simply apply a small amount of Oil on the areas that need it. As the oil absorbs and builds up in the timber fibres the less frequent you need to re apply. Surfaces should be completely dry before applying. Why is my surface not drying? This is due to over applying. Timber will only absorb so much oil within a 2-3 hour period. Flooding the timber does not make the timber absorb any more oil. Therefore any wet oil that has not absorbed in to the timber will sit on top and needs to be wiped off. This will then allow the oil to dry in the top surface layer. If the surface is tacky how do I correct it? This can happen with over applying and where excess oil left on the surface has dried and has not been wiped down. We recommend applying the oil over 2sq metres at a time in order for the oil not to dry too quickly before it has a chance to absorb in to the timber. If the surface has a tacky surface simply spray kerosene on the surface, this will soften the oil and bring it back to a wet state. Scrub the surface using Deck-Doc Oil Scouring Applicator and wipe off the wet excess oil using dry cloths. Always work an area of 2 sq metres at a time, as hot conditions hastens the drying time. What will my deck look like in 2 years using Deck-Doc Oiling System? build up the oil in the timber fibres and to give full protection. It was then neglected for 2 years. As dirt, dust & pollution settle on the surface it will dull and look dirty. This can happen over a 6-12 month period. 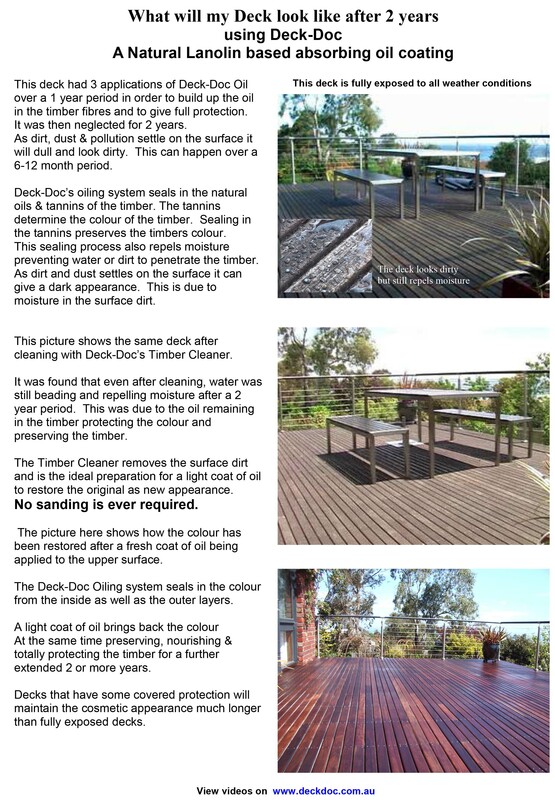 Deck-Doc’s oiling system seals in the natural oils & tannins of the timber. This sealing process also repels moisture preventing water or dirt to penetrate the timber. As dirt and dust settles on the surface it can give a dark appearance. This is due to moisture in the surface dirt. The pictures here shows the same deck after cleaning with Deck-Doc’s Timber Cleaner. The Timber Cleaner removes the surface dirt and is the ideal preparation for a light coat of oil to restore the original as new appearance. No sanding is ever required. applied to the upper surface. The Deck-Doc Oiling system seals in the colour from the inside as well as the outer layers. A light coat of oil brings back the colour at the same time preserving, nourishing & totally protecting the timber for a further extended 2 or more years. Decks that have some covered protection will maintain the cosmetic appearance much longer than fully exposed decks. What will my deck look like after 2 years using water, resin and urethane based coatings? The artificial colour disguises the natural beauty of the timber (similar to a coat of paint). These coatings leave a solid membrane on the surface which starts to crack & peel off after a short period of time. The timber is then totally unprotected & will absorb water and start to dry out. The timber will loose its natural preserving oils, tannins & colour. It is the tannins that determines the timbers natural colour. The whole surface required sanding. All nail heads had to be punched in to a depth of 3-4mm. The surface had to be sanded 3-4 mm to restore some original timber colour. It required 80 hours to sand off the water based coating from all surfaces. The vertical surfaces were most difficult and time consuming to sand back. This is a very costly restoration procedure. This shows the finished sanded surface. However in spite of the deep sanding there is some natural colour loss due to the loss of tannins from the timber. New timber should never be weathered of detanninised. Weathering and detanninising leaches out the natural oils and tannins. The tannins determine the natural colour of the timber. The natural oils preserve the timber preventing drying out splitting and cracking. 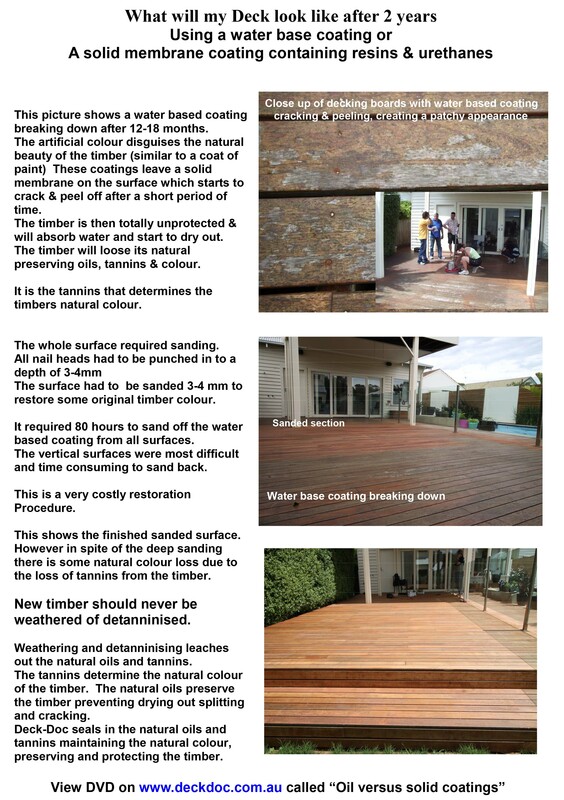 Deck-Doc seals in the natural oils and tannins maintaining the natural colour, preserving and protecting the timber. what coating was appropriate for my situation. assured me would be suitable for my cypress pine fence and panelling. very short time as well as, I would need to sand down my fence before any in between applications. The coating started breaking down after 1 year and large pieces were cracking, and peeling off. coating off in order to get back the original colour of the timber. This exercise was not viable as it would have been cheaper to replace the timber than to sand it back. The cost quoted for this job was in the thousands of dollars, way beyond which I was prepared to pay. the loose coating as possible. would improve overtime as the old water based coating continued to flake off. This picture shows the timber fence cleaned and oiled with Deck-Doc Decking Oil. will protect the timber and preserve the timbers natural colour . It has been a very stressful experience. when all the old coating is off and my fence & screens are back to their former glory. Maintenance with Deck-Doc "Revive a Deck" & "Revive All Purpose"
Q: Last summer I pressure-cleaned our 15 month old LOSP treated pine deck and applied 2 coats of your Premium decking oil. The part of the deck not covered by the verandah is turning black . We have not had any fallout from the sky and nothing else around the house has a black coloring on it. What do you think is the reason for it? A: The black spots that are caused by air borne fungal spores on the surface of the the timber. This is a common problem during Autumn. It is more prevalent during warm Autumn conditions. These powder like fungal spores grow naturally on various trees and plants and can be carried great distances in strong weather conditions. It is a common problem for gardeners as these fungal spores settle on plants and leaves and are brought down on to surfaces like decks with the rain. Radiata Pine is a very soft and porous timber and as such should never be cleaned with a pressure washer. The high pressure forces excess moisture in to the timber as well as dirt particles, fungal spores etc. It is for this reason that we have developed our own timber cleaner which is not harmful to the timber and does not leave any harmful residue behind. Deck-Doc Oil/Scouring Applicator. This should remove the black spots and restore the timber to its natural colour. We recommend to test this method on a small area using a kitchen scourer. If the black spots are persistent, that would indicate there are fungal spores growing in the timber. It would then be necessary to use our Timber Cleaner and add a small amount of household bleach to the cleaning solution. I stress only add a small amount of bleach to a solution of cleaner in the ratio of 5 litres cleaner solution add 1-2 capfuls of bleach. You will notice quite a vigorous reaction. Do not be concerned it is not dangerous or explosive. The bleach will kill any fungal spores in the timber and the cleaning operation is the ideal preparation for re application of oil. We now have available a new oil with an additional UV absorber. For treated pine we recommend our premium decking oil with Light Colour Enhancer. This product maintains the cosmetic appearance for longer as well as providing the unique weather protection of our oil. This product may not be available in your local store at present, however, if you require it, I am sure they will get it in for you. a) Is sanding my only alternative now that I have used the Deck-Doc cleaning agents? b) Will sanding the rest of the greyish areas damage the wood? I have two people in different hardware stores give me two opposite answers. c) If I sand it back after punching nails in, will the decking oil be the answer or do I have to use a stain? A: It appears that the previous coating applied to your deck has formed a solid membrane on the surface. This membrane has cracked considerably over time as the timber has swelled and shrunk being exposed to the weather. The problem appears to be that moisture has entered through these minute cracks and settled between the membrane and the surface of the timber, creating the dark patches. The cleaner can not remove this membrane as it is almost the same as a coat of paint on the surface. We suggest that the best way to remove this membrane is by sanding. I would advise you that for future ongoing maintenance you use Deck-Doc premium decking oil with light colour enhancer. This product has a UV absorber and will maintain the cosmetic appearance considerably longer on the weather exposed part of the deck. Future on going maintenance will never require sanding again, but merely a light re coating of oil will clean weatherproof and restore the natural colour of the timber.